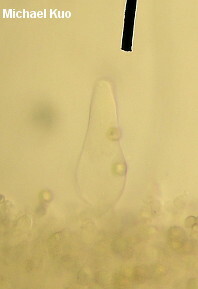 Like other species of Pluteus, Pluteus leoninus has a pink spore print and gills that are free from the stem. It grows on or near the deadwood of hardwoods, and it is fairly easily distinguished from other species in the genus on the basis of its somewhat velvety yellowish cap, which usually features a brownish center, at least when young. 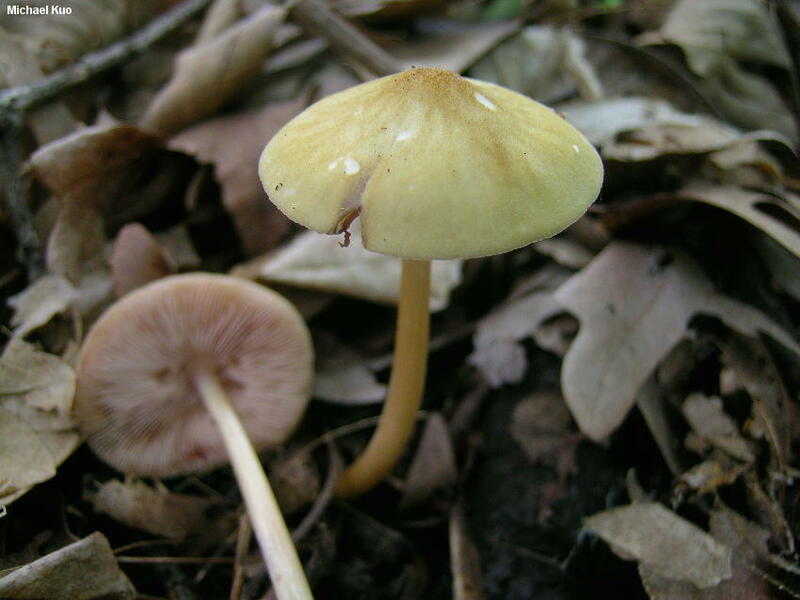 It has a rather long stem, for a Pluteus, and it tends to appear in colder weather (late spring and fall, or over winter on the West Coast). 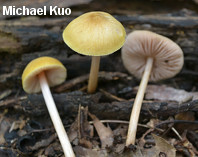 Pluteus chrysophlebius is similar, but typically smaller, and its non-velvety cap is bright yellow, without brown shades. 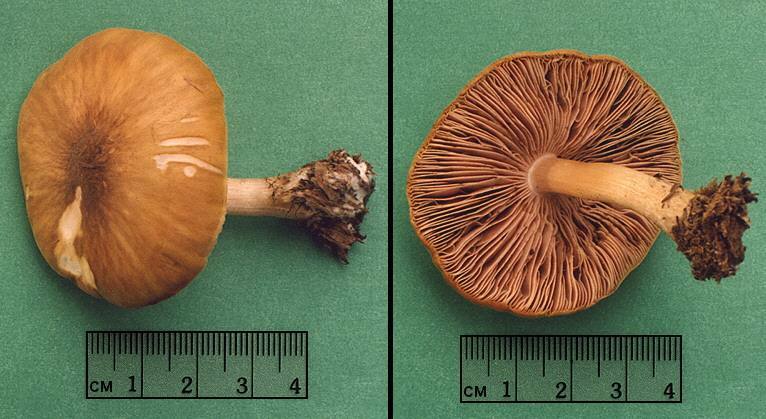 Pluteus leoninus is a European species, and preliminary DNA evidence (Justo et al., 2008) supports using this name for our North American versions, which often have slightly browner young caps than their European counterparts, and which have traditionally been called Pluteus flavofuligineus. However, the plot may have some twists to it once a mycologist studies this area of the genus in detail, since Justo and collaborators studied a total of four North American collections and determined that, while two of the collections "do not show molecular differentiation with European specimens," two other collections "represent a distinct molecular lineage, but . . . do not show morphological differentiation" (I was present when three of the four collections were made, and can attest to their macro-morphological inseparability). In short, there may be a "cryptic species" or two to be uncovered, so stay tuned. Ecology: Saprobic, growing alone or scattered on decaying hardwood logs and debris, or growing terrestrially; causing a white rot; late spring, early summer and fall east of the Rocky Mountains, over winter on the West Coast; widely distributed in North America. The illustrated and described collections are from Illinois and Québec. Cap: 3-5 cm; convex or bell-shaped at first, becoming broadly convex or nearly flat, but often retaining a broad central bump; finely velvety to silky, especially over the center; golden to dull or brownish yellow, with a brownish center; the margin not lined. Gills: Free from the stem or nearly so; close or crowded; short-gills frequent; whitish at first, becoming pink. Stem: 5-9 cm long; up to 0.5 cm thick; tapering slightly to apex; bald or finely silky; whitish to yellowish or brownish; becoming hollow; basal mycelium white. Flesh: Thin; white; unchanging when sliced. 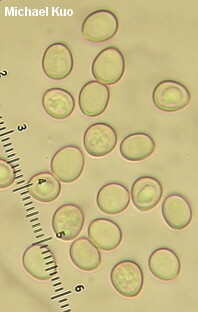 Microscopic Features: Spores 5.5-7 x 5-6 µ; subglobose to broadly ellipsoid; smooth; ochraceous in KOH; inamyloid. 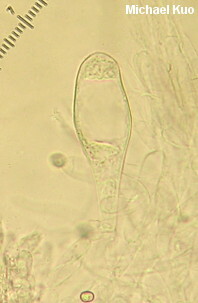 Pleurocystidia widely lageniform, subutriform, or subsaccate; thin-walled; occasionally with one or two small hooks; hyaline in KOH; scattered; to 100 x 28 µ. Cheilocystidia fusiform or narrowly lageniform; thin-walled; hyaline in KOH; often abundant; to 65 x 12 µ. Pileipellis a cutis. Clamp connections absent. REFERENCES: (Schaeffer, 1774) Kummer 1871. (Fries, 1821; Saccardo, 1887; Atkinson, 1902; Smith, 1949; Singer, 1956; Smith, Smith & Weber, 1979; Arora, 1986; Vellinga, 1990; Phillips, 1991/2005; Breitenbach & Kränzlin, 1995; Barron, 1999; Roody, 2003; McNeil, 2006; Justo et al., 2011; Kuo & Methven, 2014.) Herb. Kuo 05300402, 07010704, 06171002, 07061301.